This entry was posted on Tuesday, March 27th, 2012 at 8:34 pm and is filed under Garden, Gardening, Homesteading, Self-Sufficiency. You can follow any responses to this entry through the RSS 2.0 feed. You can leave a response, or trackback from your own site. Wow, the crowd is hostile out there. We should have an update out pretty soon. ha ha Sandi……maybe Linda should do the blog, lol. She has to write a small book, just talking about tilling the garden. Funny..Funny. Here I just through a picture up of my new toy and look at all the spit wads that get shot my way. A very nice garden tiller. Sonny, just ignore them. ‘thar jus jealous! A few questions. What brand and size is it? What made you pick that one over others (we do not have a lovely toy such as this)? How big is the garden that you have? Actually, there were several reasons for getting it. 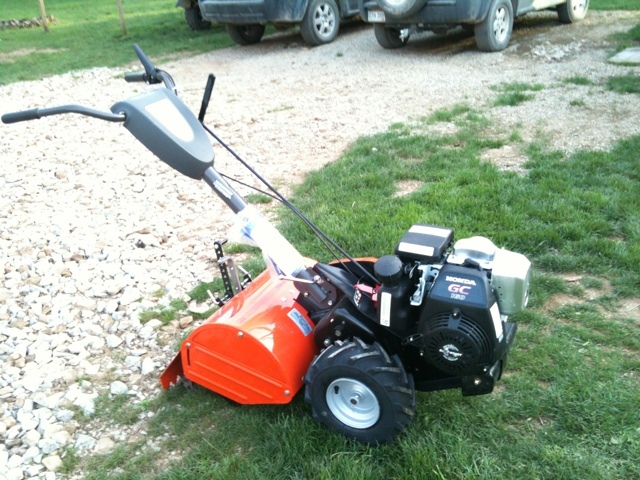 We decided on the 160cc 17″ Husqvarna. I have a wood splitter with the Honda engine and really liked how easy it was to start and very durable. We plan to use the tiller to keep the weeds/grass down between the rows and the 17″ will work for it. We do not use weed killer here and you can spend a long time weeding by hand and if you have a day or two lapse they will take over. This year we nearly doubled our garden size so it was even more important to us. I think we have around 2500-3000 square feet now. Cant wait to see the tiller in action.